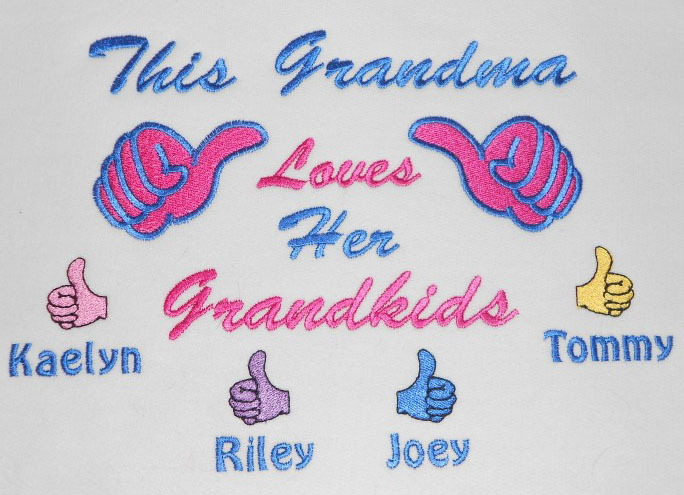 What a neat way for�grandpa to brag about his grandkids!��You will receive a Gildan ultra cotton 100% cotton tee shirt. All shirts are unisex sized. I will embroider your design on the front chest of your sweatshirt. I can change the wording�from Grandpa to whatever you need.�I will adjust the thread colors according to the color shirt being used or you may request your colors. The design as shown is 10"W x 7"H The size will vary according to how many children you add. This price is for the design with up to 4 names. Any additional names are $2.00 each. I use the finest rayon embroidery threads for long lasting and brilliant color. PLEASE NOTE THAT I WON'T BE USING THOSE KIND OF COLORS OF THREADS ON A MAN'S SHIRT.